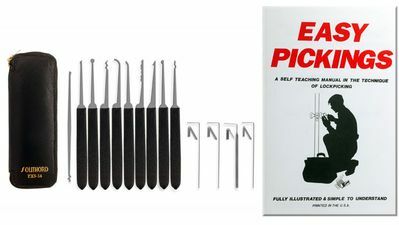 Super pick set set and instructions to learn the art of lock picking with maximum comfort or to allow all day usage with more comfort. Be your own locksmith. The 14 piece set has enough tools to handle a wide variety of situations. The poly handles will help you to pick longer with less fatigue. The "Easy Pickings" Manual will provide instruction on proper technique for opening most common locks. This set will allow you to open most pin tumbler locks, doorknob locks, many auto locks, padlocks. Tools included are 9 picks, a broken key extractor, four tension tools, six slip on polymer vinyl sleeves and a top grain leather case. Be prepared for a wider variety of locks and more comfort if your hands are not used to this kind of work. The polymer handles are softer than the steel and allow you to practice more comfortably for longer periods of time.